This pendant was originally beaded as a sample for my Bead Embroidery Class. 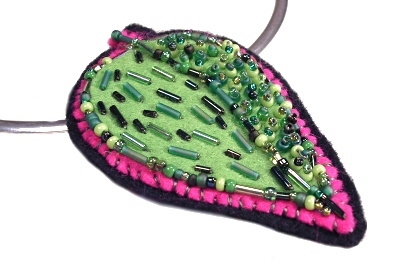 It uses couching to outline and delineate the leaf with bead stacks to decorate. I beaded onto three different coloured layers of felt, backed with interfacing and then backed it with felt to finish. It hangs from a silver band necklace.